Concerned about a member of staff or volunteer? Safe Recruitment is a critically important area for any agency that works with children and young people. We must all ensure that we guard against the minority of prospective applicants who pose a risk to children and young people. 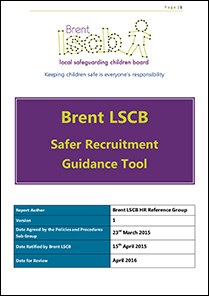 Brent LSCB has developed a best practice guidance document aimed to help organisations. To download a copy of this guidance click on the image below.